As most are aware I recently switched from Nikon to the Fuji collection of cameras and lenses. Over the last year my photography has progressed further than in the last 20 years because of this. I'm an old dog. I've been making images since the mid seventies. I was lucky enough to have a middle school that had a beautiful darkroom to explore and create in. In High School I contributed to the newspaper and continued to make images on film until my switch to digital in 2005. I went with what I knew, which was Nikon. A trusted brand that I had been shooting with for over 20 years. I began my journey with a Nikon D70 and graduated to a D7000. I rented several full frame Nikon cameras as well. As my abilities grew with digital I contemplated the move to owning a more professional system. This is when I found Fuji. I rented the XT1 and loved it. Still not 100% sure I purchased the X100T to see if I wanted to commit. Reasoning was that I wouldn't have to invest in lenses and would only have to sell one item if it didn't work out. Well it worked out. I love it and I kept it. I now have added the XT1 and the 35mm f2, 56mm 1.2 and the 18-55mm kit lens. Next on the list are the 16-55mm 2.8 and the 50-140mm 2.8 zooms. All this for half the cost of a similar Nikon system. It also looks like Fuji is about to release, crossing my fingers, the XT2 with a 24mp sensor. This is all rumor but with the release of the XPro 2 with a 24mp sensor it only makes sense that the update to the XT1 will follow suit. 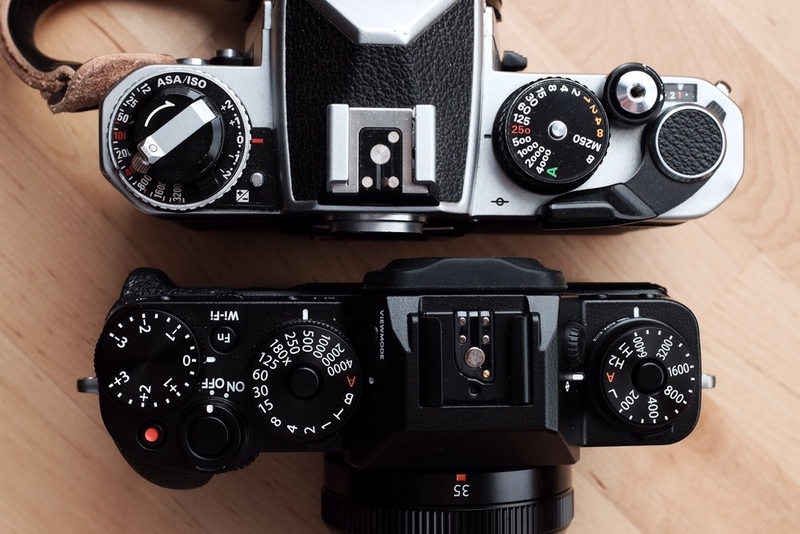 When you look at my old Nikon FE2 alongside my new XT1 you have to see the similarities. Fuji was brilliant to go with this form factor. There is a huge population that grew up with old film cameras. The nostalgia factor alone is enough for some to purchase any of the new generation of cameras that have the look and feel of old school film cameras that ruled for decades. They haven't reached the status of Nikon or Canon but I believe it is just a matter of time. I believe that digital camera technology is till in its infancy and has nowhere to go but up. New features and functions are being released at an astounding pace. Who would have thought, ten years ago, that Wi-Fi would be an expected feature in a new camera. So camera companies please keep it up. My abilities grow with each new feature and my mind is challenged by each innovation you make.